Latest News › What’s different about infrared heating for renovation projects? More & more homeowners are choosing infrared heating for the wide range of benefits it offers renovation, retrofit & new build projects. So why’s it different & why does it make such a compelling heat solution for renovation projects? The answer is simple. Herschel heaters are super-slimline, energy efficient and can be mounted on ceilings or high up on walls with minimum cost and disruption. They blend in into the décor and, best of all, provide gentle heat which radiates throughout the room, keeping walls, floors and people comfortably warm. Electric underfloor heating is popular for the home renovation market but is expensive to install and run. It also suffers from lack of control and presents a future maintenance problem because entire floor coverings will need to be pulled up in the event of a failure. When considering renovation projects infrared heating presents an obvious but often overlooked solution. A quick and easy to install solution that maximises available wall space and avoids the huge disruption that comes hand in hand with alternatives. 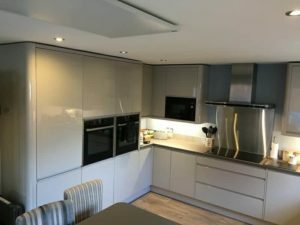 Mr Axtmann recently installed a Herschel Select 700W panel on his ceiling to provide heating for his kitchen renovation and is delighted with the results. The answer laid with Herschel and their range of far-infrared heaters, which they claimed could be fitted to walls and ceilings. Once the technology was explained, it made perfect sense in that they heat us the same way as the sun, which is quite a long way away and above our heads! Does an excellent job of heating us in the kitchen. Since fitting, people have been amazed how good it is, after pointing out the panel, which nobody notices. For more information, take a look here on what our customers are saying about their heating installations.